At 5:41 p.m. on May 22nd, 2011, a powerful tornado hit Joplin, Missouri. Its 200-mph winds carved a path of destruction as it barrelled through the town in 45 seconds. That same, horrific day led to the beginning of an incredible story of compassion at Joplin’s St. John’s Regional Medical Center—now called Mercy Hospital Joplin—and it’s a story that continues to unfold every day. It is a story that exemplifies compassion, leadership, community, and complexity theory. I had the privilege of hearing the story of St. John’s Regional last week during a presentation by one of Mercy’s vice presidents, who recounted the events of May 22nd, 2011, to a crowd of 400 people unsuccessful at holding back their tears. Part of the Sisters of Mercy Health System, St. John’s had 183 patients in its care as the tornado—an EF5 in strength—steamrolled over Joplin, a town of about 45,000 residents. Gas lines broke as the powerful winds peeled the roof off the structure, shattering windows, pulling out electrical cords, and knocking out power. Six people died at the hospital that day—one visitor and five patients on ventilators, which shut off with the power outage. John Seay’s mother was one of the five patients who died that day. She had been breathing with the aid of ventilator and died when the hospital’s backup generator failed to restore power. John, who was with his mother when she died, left her side upon her passing knowing that she would understand the need to help others. Without hesitation, John joined the hospital staff and visitors who assisted in evacuating the destroyed building. He found Belinda Pfeiffer desperately trying to move her father who had been flung into a bathroom wall. “I’ll help you,” John told her. Many are the stories of compassion that unfolded during the 90-minute patient evacuation to nearby hospitals, clinics, and to the hall across the street from St. John’s that acted as Joplin’s triage center. The entire town—and anyone that could get there in the wake of the tornado’s destruction—provided assistance. Within hours, anyone who needed medical attention was being cared for at a makeshift or proper facility. All workers present during the tornado and those that were on leave became active participants in the care of the previous patients and the newly wounded. Follow up on all 183 patients. A week after the tornado hit, a 60-bed mobile medical unit blessed by Bishop James Vann Johnston Jr. began its operation as a tent hospital provided by the Southern Missouri Disaster Medical Assistance Team (or DMAT), which is part of the National Guard. This mobile hospital combined with St. John’s Express Care, a clinic that narrowly escapade the path of the tornado, reopened to provide medical services to the Joplin community. Since the disaster, hospital workers have been assisting other care facilities in Missouri, Kansas, and Texas. The commitment of full employment by the Britton translated into the growth of other care facilities, such as the McCune-Brooks Regional hospital in Carthage, Missouri. This regional hospital increased its capacity from 25 to 52 beds and now has a new gastroenterology department, a larger ENT unit, and a third surgical suite. Mercy Hospital was not alone in its actions. Missouri’s Governor, Jay Nixon, not only pledged his assistance, he personally worked through the wreckage and delivered support to others. A collaborative team was instituted to bring St. John’s back to operation with daily meetings, a command center, and a detailed plan. Hospital leaders were joined by representatives from the Federal Emergency Management Agency (or FEMA), the Department of Homeland Security, the U.S. Army Corps of Engineers, the Office of the Governor of Missouri, the Department of Health and Human Services, and other state and federal regulatory bodies, including the Centers for Medicare and Medicaid Services. St. John’s Regional was renamed Mercy Hospital Joplin in late January. Also in late January, the tornado-ravaged ruins of St. John’s Regional saw its first wrecking ball. Five buildings across 47 acres—totaling more than 1.2 million square feet—will be torn down and cleared to make room for a new hospital building, which is slated for completion in early 2015. The new hospital will be built with 327 patient beds and will eventually be expanded to house a total of 424 patient beds. How is the story of this hospital connected with complexity theory? 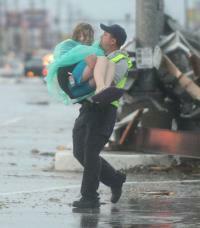 Their post-tornado experience started in total chaos where triage and command and control were the only options. But two days later, Britton issued a challenge to hospital leadership: be operational within a week, take care of our own and others, and keep everyone employed. This is a complex challenge and one that Mercy systematically addressed through their leadership along with support of the government and the community. There is a mix of order and disorder. It is clear that hospital leadership and staff experienced emergent order—from their makeshift facilities to their current rebuilding efforts. The emergence from this situation not only benefited St. John’s Regional and the Sisters of Mercy Health System, but it also helped the hospitals and communities where its workers shared their talents. The story of St. John’s Regional is one that illustrates how great disorder can be turned into different forms of order with human effort and the work of many agents banding together to create a truly emergent community.